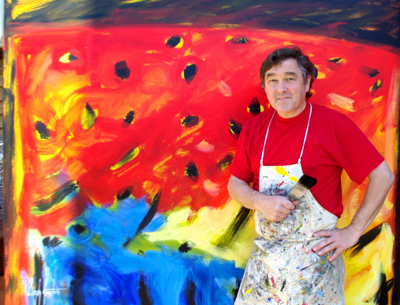 Deryk Houston's work is about things that are fertile, the community, and children's rights. 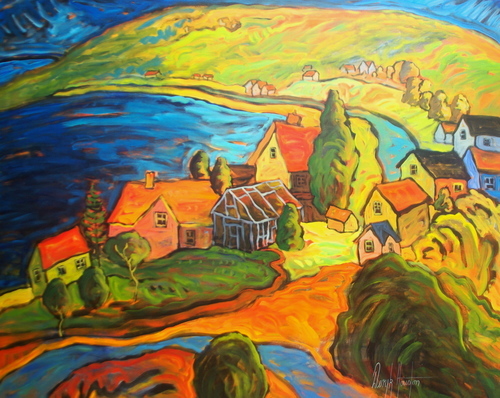 "Greenhouse at Gonzalez Bay" is a large, five foot by six foot, vibrant acrylic painting that is a good example of his use of colour and his energetic brushstrokes. He has devoted a large amount of his life to Children's rights. 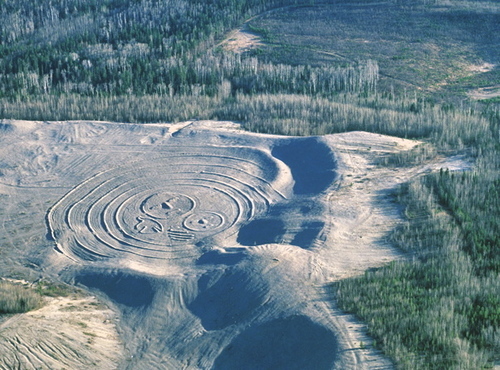 In support of children's rights in Iraq in 2001 he created a primitive,one thosand foot diameter earthen work in the north east of British Columbia. The National film board of Canada produced a documentary on his work. (From Baghdad to Peace Country) It was directed by Sherry Le Page. Every once in a while Deryk finds that he must get away to quiet places. The Muskwa Kechika is one of those places. 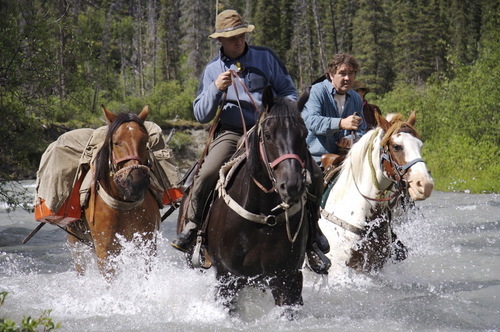 In this photo by Wayne Sawchuk, Deryk on the right on the paint can be seen making one of the hundreds of river crossings over a twelve day period in the mountains. Deryk also loves to do abstract paintings. He feels that the two worlds ..... abstract and landscape, are often viewed as extreme opposits when in fact they can be actually not that far apart. Not unlike our world where conflict is common even though both sides only want peace and stability for their children. So he goes back and forth exploring these ideas.... not wanting to be placed in a box where life could be limited. 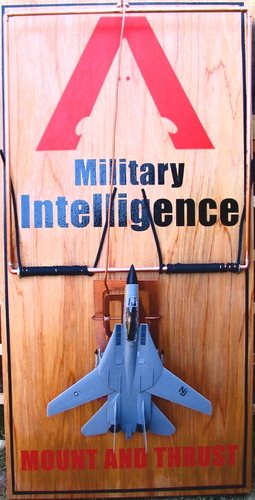 Deryk created this five foot tall moustrap/fighter jet sculpture in support of peace. It was accepted into the Canadian War Museum in Ottawa in 2008. He simply wants people to think about what might happen if we believe that we can solve conflicts through simple solutions. We need to keep in mind that using force often kills many civillians, creates millions of refugees and costs billions of dollars and can bankrupt the country that employs these kind of weapons..
His dream is to create a full size version using a real fighter jet sitting on a giant mousetrap to match. Open to ideas if anyone would like to help make this happen.